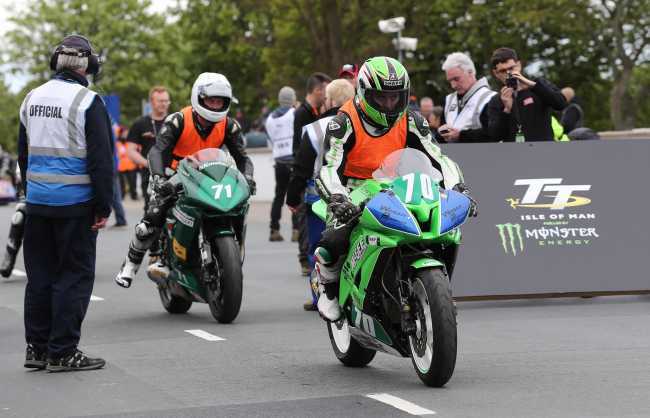 Derek McGee leads Geoffrey van Koekelbergh off the line for their first look at the TT Mountain CourseDerek McGee leads Geoffrey van Koekelbergh off the line for their first look at the TT Mountain Coursenter;">Qualifying for the 2015 Isle of Man TT Races, fuelled by Monster Energy, got underway on Saturday evening and although weather conditions meant the F2 sidecars failed to get out on track, the Lightweight class got a full session under their belts with Ryan Farquhar leading the way at 117.12mph. The session got underway with the speed controlled lap for the solo and sidecar newcomers and TT rider liaison officer Richard 'Milky' Quayle, the 2002 Lightweight TT winner, led the solos away with Tom McHale, Robbin Harms and Franck Petricola behind him. 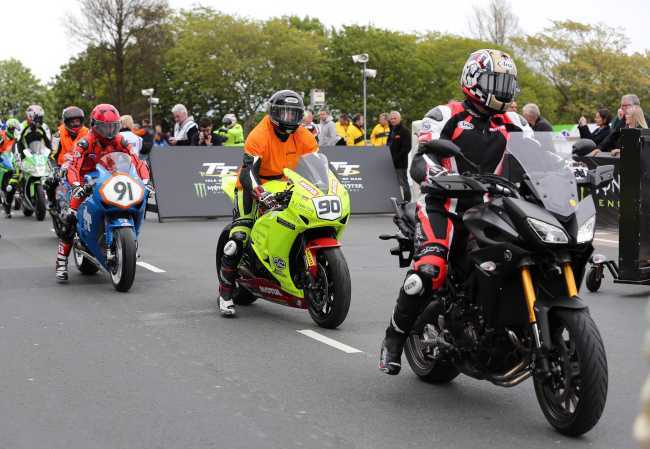 Second Rider Liaison Officer John Barton took out his Lightweight machine with Derek McGee, Dan Harrison and Geoffrey Vankoekelnbergh all similarly mounted as they got their first taste of the Mountain Course on closed roads. Soon after it was the turn of the F2 Sidecar newcomers with seasoned regulars Roy Hanks/Kevin Perry, John Holden/Dan Sayle and Tony Baker/Fiona Baker-Milligan showing the 12 debutantes around including Terry O'Reilly/Aidan Browne, Alan Warden/Stuart Clark and Pascal Gassmann/Olivier Chabloz. Also out on track was reigning British F1 Champion Sean Hegarty making his first appearance at the TT since 1996. James Neave partnered him with their 675cc Triumph outfit certainly standing out. At 6.57pm it was the turn of the first official session with the Lightweights setting off down Glencrutchery Road and the honour of being first away was Jamie Hamilton and Michael Sweeney. 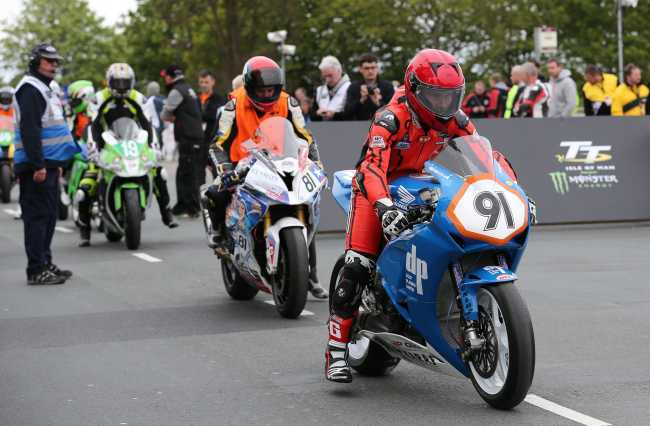 They were followed in quick succession by Junior Manx Grand Prix winner Andy Lawson and Dan Cooper, Michael Rutter and James Hillier and Ivan Lintin and Michael Jessopp. All of the newcomers were soon back out on the course whilst Hillier was quickest through the Sulby speed trap at 156mph. The first rider to complete the lap was Hamilton at 112.19 swiftly followed by Sweeney at 111.18 and Lintin who briefly went quickest at 114.64. Hillier was also over 112mph but the quickest two riders on the opening lap were Gary Johnson and Ryan Farquhar. The duo had left the line together and lapped at 114.866 and 114.827 respectively whilst Lee Johnston was also going well on another KMR Kawasaki at 113.32. Second time around and Farquhar and Johnson were still circulating together and increased their speeds with the Northern Irishman going to the top of the early leaderboard at 117.12, already his fastest ever lap on a Lightweight machine. Johnson wasn't far behind at 117.02 with Lintin also improving to 116.60. Johnston was up to 115.40 with Cooper slotting into fifth overall at 113.41mph. Meanwhile, McGee was going well on his Lightweight Kawasaki at 107.60 with McHale, continuing on his Superstock machine, also impressing at 108.12. However, rain was beginning to fall at various parts around the course and Clerk of the Course Gary Thompson ended the session early meaning the F2 Sidecars missed out their session and will have to wait until Monday evening to get their first laps.